You can share your iTunes songs and your iPhoto pictures on your local network, so why not iCal calendars? Actually, you can - with a little help from CalTalk. 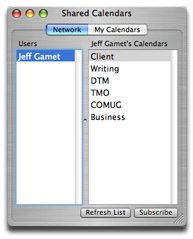 This handy application lets you publish and subscribe to calendars just like you can with a .Mac account or a WebDAV server, but only for other iCal users on your local network instead of through the Internet. Click the My Calendars tab. Check the calendars you want to share. Choose which calendars you want to share. Click the Network tab in CalTalk. Select the name of the user you want to subscribe to in the Users column. 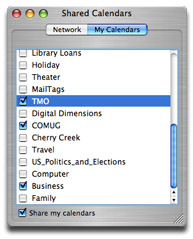 Select the calendars you want to subscribe to in the Calendars column. Select the calendars you want to subscribe to. The calendars you subscribe to will appear in iCal, but you won't be able to edit them, and CalTalk must be running for other users to see your published calendars. This is a great way to let everyone on your private network know what you are up to without publishing you schedule on the Internet, and it doesn't require a .Mac account. Also, if you have trouble seeing and subscribing to other user's calendars in the CalTalk window, you may have to open port 24080 in your Mac's built-in firewall. If you aren't sure how to do that, check out my Quick Tip on creating custom firewall ports. CalTalk is Donationware, so if you find it useful be sure to make a donation to the developer. You can download CalTalk from the CalTalk Web site. Jeff Gamet is TMO's Morning Editor and Reviews Editor. He lectures, teaches and speaks on Mac OS X and design-related topics, and is the author of The Designer's Guide to Mac OS X from Peachpit Press. if you have tips or tricks to share, or Mac-related questions you want answered.